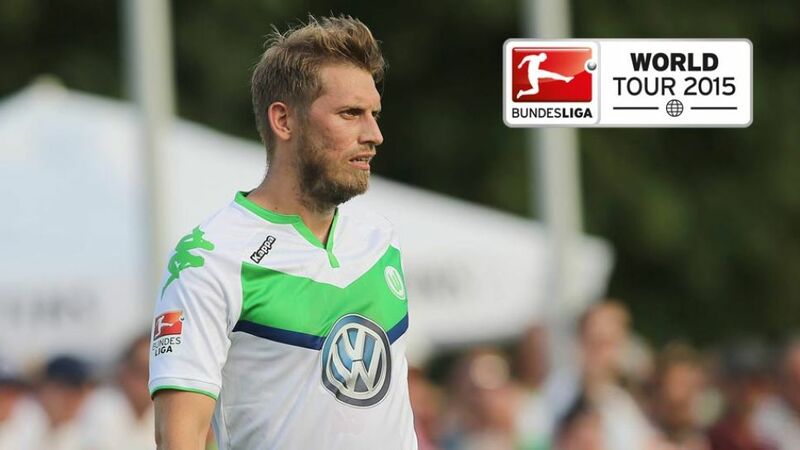 Gdansk, Poland - VfL Wolfsburg were held to a 1-1 draw by KS Lechia Gdansk in their Bundesliga World Tour 2015 clash. The Wolves took a first-half lead through Aaron Hunt, but Mario Maloca equalised for the hosts with ten minutes remaining. Dieter Hecking's side were on top against their Polish top-flight opponents from the first whistle. Hunt shot wide after three minutes while Bas Dost struck the woodwork soon afterwards. However, it took until the 33rd minute for the Wolves' dominance to be rewarded; Hunt applying a calm finish past Gdansk keeper Marko Maric. Despite making six changes in the second half, including the entrances of Max Kruse and Xizhe Zhang, the visitors remained in control but failed time and again to beat Maric in the Gdansk goal. Their profligacy was punished when Maloca headed home the equaliser in the 80th minute. Youngster Oskar Zawada, teed up by Kruse, then spurned a clear-cut opportunity for a late winner as Hecking's side were forced to settle for a draw.